And I’ll be honest I wasn’t happy. Well, that’s not right, the paint job is my usual solid tabletop, the squad is done. but that was the problem. I think the sentinel made me realise that some of the joy of painting had been substituted for the joy of completion. I’ll be honest I don't get to play often, so I’m primarily a modeller and painter. 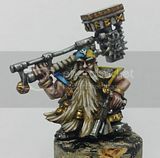 and recently I think I've been painting more like a player, if that makes any sense to anyone, I’ve been painting sometimes 10 guys at once, so I can get a unit done. Don’t get me wrong, I do take pleasure in that but I’m not really learning anything from it. so I decided it was time to mix it up. To get back on track, challenge myself, learn, improve. I dove into the bitz box, found a full model I could build, and set about making a model on a more display oriented stand, from an army I don't have, simply for the challenge and joy of painting him. I know I wont win a demon with him, that’s not what this was about – it was about taking my time with 1 model, doing some things I never do and challenging myself. This model taught me a lot. NMM – i never do this, and learned a lot by trying it. wasn't that successful but the next one will be better. the yellow, some parts of the model are beautifully smooth blends, other parts look more like a dogs arse. the red, highlighting red, ugh. but still some of it was really good, some not so much. and his face. I wish I’d used a different one as the sculpt has issues, but that's what you get when you try to make a display model from spare parts. I’m really glad I did this, and will be doing a lot more like it. It will allow me to explore different armies without building a whole list and buying a ton of models for a start. I have enough armies. in fact I should probably sell a few, but I really enjoyed this, and felt like I learned something so will be doing more. now I know you are probably thinking “where's the chapter badge”, well I am going to do one, but I wanted to practice first. I’ve done one practice pad, and it’s got some issues, so I want to do a few more before I commit it to the model, but rest assured I will finish him. Because I want to be a better painter. and modeller. I’d like, ultimately, to be able to enter a painting competition and have a chance of winning. to that end, any comments, criticism or help is gratefully received, and as always.. I don't get to play much (twice in 5th Ed !). But my painting is sparodic and doesn't really feel as if it improves much at all. I just want to finish my armies so I can get them all out and play. So, yeah, finishing things is 'winning' in my book. I think your second finished squad is a thing of beauty, you should be pleased. The squad looks awesome! Filled with great conversions and paint jobs. I know what you mean about feeling the need to improve. I have been doing tons more work with green stuff to get better at it. Best thing you can do is change it up. The marine is a nice change. Remember that those models will always be there, waiting for you to return to them when the time is right. I understand what your going through, painting my IG makes me feel stagnant and thats why im mixing it up with some crimson fists...to try new things...maybe learn something. I dont like to mix it up too much in an existing army bc then it wont look uniform, which would kill me...do its always best to learn on a different army for me. but I do like your imperial fist you got there, good start, i think he could be a little more "yellow"...but crisp so far! You are doing the right thing by switching tack. If you aren't loving the production side - but need to get the job done - reward yourself by going completely left field for a model or two. I'm currently painting some Sharpe 95th rifles just because I'd never done napoleonics and the idea excited me. That's what you need to grasp, the excitement. Then the return to the familiar can actually be pleasant. Col. yeah I've just got stuck in that "get them finished" mentality so am forcing myself to model and paint for it's own sake for a while. Canolli, I think it's the same with any high model count army, it's all about uniformity so we get stuck repeating the same paint job. as to the yellow, he is actually really yellow, but I had the devil of a time photographing him. my usual background made him totally orange, this was the best i could do. but his base is golden yellow, worked through sunburst, to sunburst +white. Man, I feel the pain of churning out models. I must say though, I do still get a kick out of completing units. I am a fan of the binocular scopes, they really add a bit more to the unit, I have shamelessly stolen this idea of yours for some of my lasguns to add some more character to the individual models. I am a fan of this squad, some great work on them. You did a great job getting the scout heavy bolter onto a normal guardsmen, I simply used the arms on a cadian torso. It worked but he looked a little too burly.